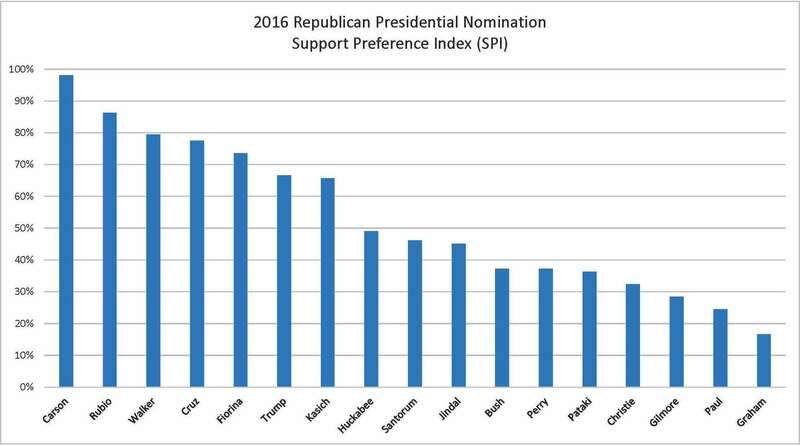 Earlier this week, Quinnipiac University released its latest poll of the Republicans seeking the nomination for President of the United States. There are many ways to look at this or any poll, but this one was interesting because of a second question in the survey that asked who would definitely not be supported. Donald Trump was the winner in the first question but the biggest loser in the second. In other words, he enjoys the most support as the favorite candidate, but also carries the most baggage as the candidate who is least likely to be supported as the nominee. Unfortunately, this seemingly paradoxical result merited little comment from the various political analysts who weighed in on this most recent national poll. Looking at the numbers in another way, you arrive at the conclusion that Dr. Ben Carson is actually the most preferred candidate in the field with the least baggage at this early stage of the election. The media generally focused on the percent of those polled who preferred each candidate. Donald Trump easily led with 28 percent, followed by Dr. Ben Carson with 12 percent, followed by Jeb Bush, Ted Cruz, and Marco Rubio rounding out the top five with 7 percent each. But Donald Trump also led with 26 percent saying they would definitely not support him as the nominee of the party. In other words, only 74 percent would support him. By contrast, all the other candidates were more acceptable with Dr. Carson enjoying the support of 95 percent of those who responded to this question. I decided to look at the poll results in three ways. How does each candidate rank as the first choice? How does each candidate rank on the support question? How does each candidate rank when the percentages of preference and support are combined? As stated, there are many ways to manipulate numbers, but if you are interested in who enjoys the most support and has the least baggage among the seventeen candidates, this is one way of answering the question. Its early in the nomination process. I wonder how this will change over the next year. Here is the spreadsheet to show the calculations used in this analysis. This entry was posted in Media, Politics and tagged Bush, Carson, Christie, Cruz, Dr. Ben Carson, Fiorina, Gilmore, Graham, Media Bias, Pataki, Paul, Perry, Quinnipiac, Republican, Rubio, Trump, Walker. Bookmark the permalink.